My local Mayor Svante Myrick was on MSNBC the other day talking to Ronan Farrow about Ithaca’s Living Wage. The city minimum wage is now $12.62/hr. Couldn’t embed the video in this post but watch it at the link. Myrick seemed to get a little emotional when asked about his Mom & her feelings about the new living wage. 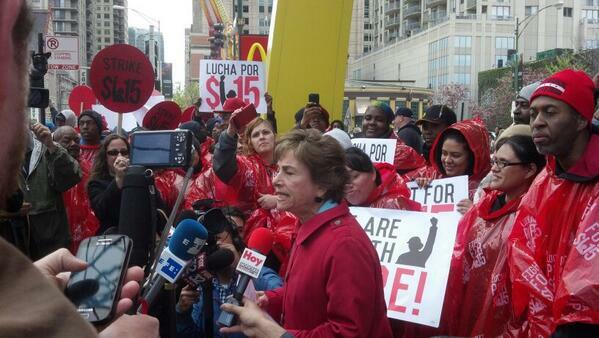 Today, fast food workers protested poverty wages globally. Lots of updates and articles at the #fastfoodglobal ←link on Twitter. Even as a manager at a Charleston @mcdonald‘s, Shenee STILL only makes $7.25/hr. Lord, have mercy on the working man. Please help me up Lord, ’cause I’m going down.